The 'speculative execution' CPU performance enhancing technique that is prey to SPOILER might remind one of the well known Spectre vulnerabilities first publicised in January 2018. However SPOILER's data leakage "stems from a completely different hardware unit, the Memory Order Buffer," write the researchers. Thus it isn't currently mitigated by current Spectre patches. 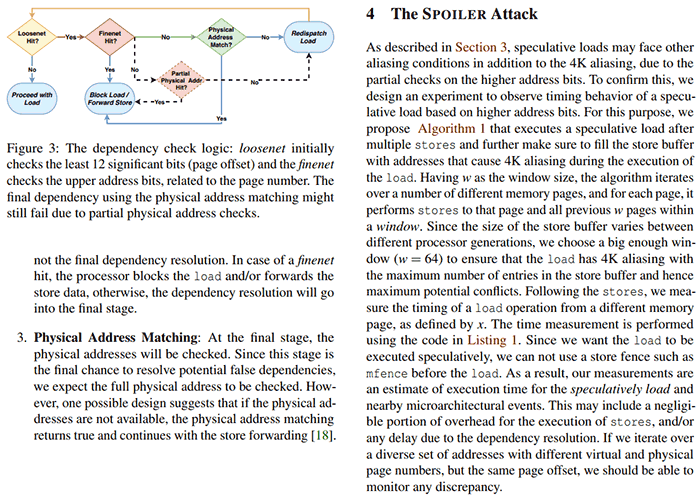 "Spoiler is not a Spectre attack. The root cause for Spoiler is a weakness in the address speculation of Intel's proprietary implementation of the memory subsystem which directly leaks timing behaviour due to physical address conflicts." Via this novel microarchitectural leakage critical information is revealed "about physical page mappings to user space processes". Discussing the technique in more depth the researchers added "To exploit the leakage, we used the speculative load behaviour after jamming the store buffer." Importantly the SPOILER vulnerability can cause leakages in user space with no special privileges, on any OS, and works from within virtual machines and sandboxed environments. Leaked data from SPOILER attacks isn't useful on its own but can help speed up existing attacks more efficiently, or to devise new attacks using the novel knowledge. The research team got in touch with Intel about SPOILER on 1st Dec 2018. Since this news hit the wires sometime yesterday, an Intel spokesperson has been quoted by The Register, providing official reaction. The spokesman said "we expect that software can be protected against such issues by employing side channel safe development practices. This includes avoiding control flows that are dependent on the data of interest. We likewise expect that DRAM modules mitigated against Rowhammer style attacks remain protected." No (or not entirely). One of the main points of the x86 architecture is backward compatibility with old software, so deleting instructions because they're old makes no sense in this part. What would happen is that the CPU would simply emulate the old instructions on the new silicone, instead of retaining the silicone originally designed for those old instructions. They may be a little slower, but who cares if they were slow to begin with? I still see people using the old FPU-style floating point instructions. Saying that, I recall that Intel has announced the removal of some really old, barely used instructions recently, and that was a big announcement (as it could break old software). The lack of recent security vulnerabilities on AMD CPUs is much more likely to be a result of AMD having a better design philosophy, instead of trying to squeeze every last bit of performance out of the silicone at any cost like Intel. Not quite, the intell is/was keeping instruction that are/were almost not used and are intell specific. Instructions like that in AMD processors (AMD specific that was not used widely) were usually removed after few iterations. So the statement is rather true. Apart from that both are having lots of undocumented instructions that may affect security.